I’ll try to make this short….I need your help! 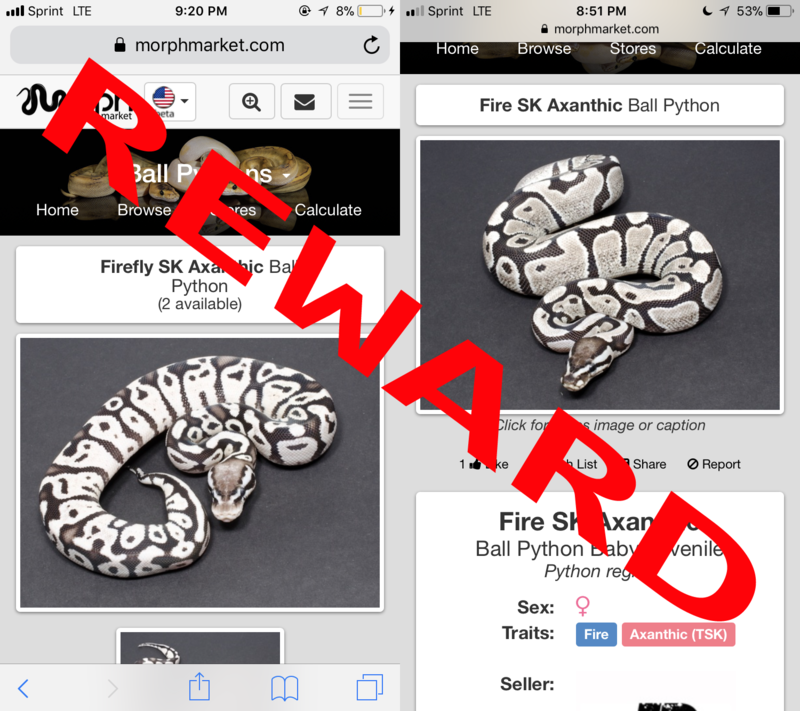 I have 2 animals that were sold in November of 2017 that are currently part of a fraud investigation and I need your help finding them. 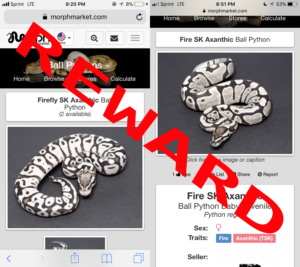 The exact animals are pictured above in the “Reward” photo; a Firefly SK Axanthic and a Fire SK Axanthic, both females. 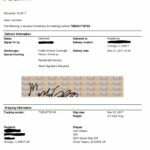 I was contacted through MorphMarket and the animals were purchased with a credit card and shipped to a residential address in Chicago. Since that point in time a dispute has been filed on the charges and the funds taken while a full investigation is underway by the credit card company. Several pics of these details are at the bottom of this blog post. 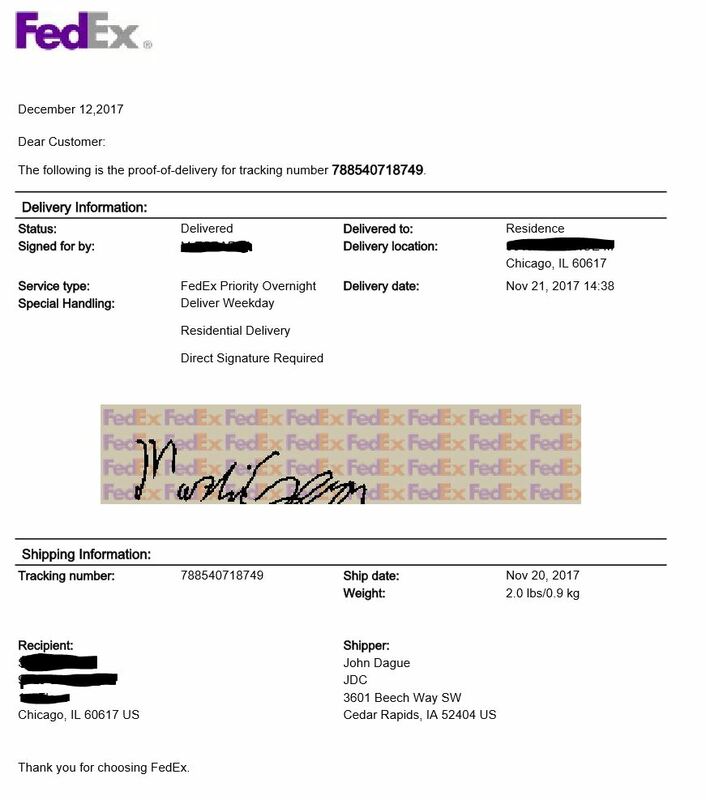 This same “buyer” purchased from another well known breeder in the industry through MorphMarket as well but shipped to a different residential address in the Chicago area. If you or anyone you know has or sees these animals being offered for sale please contact me directly via email or cell (john@jdconstriction.com 319-423-9987). 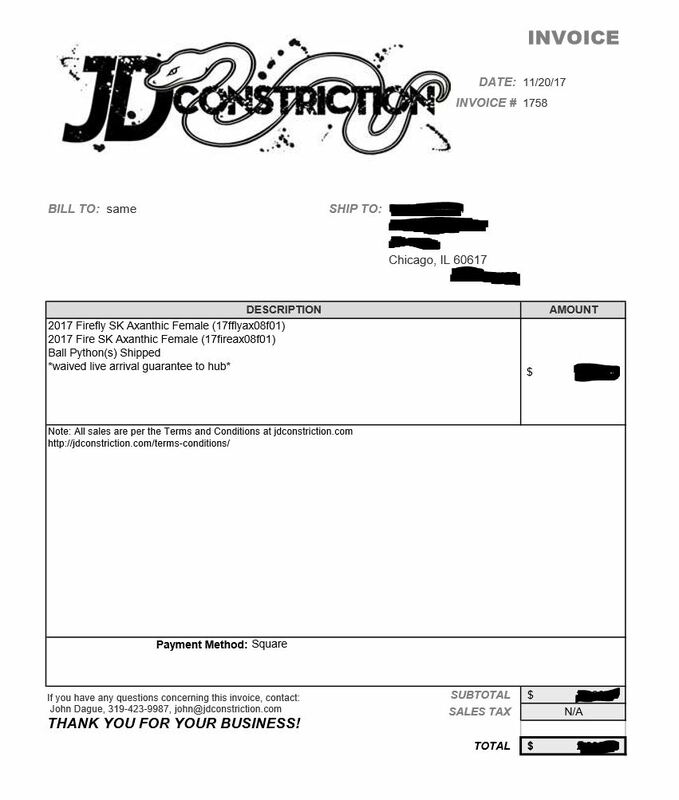 Anyone who is able to provide information leading to return of the animals or the closure of the dispute in our favor along with information which can be used to press charges I will gladly give a $500 credit good towards any purchase. The short answer is that currently there is only 1 Stormtrooper as of the date of this post. 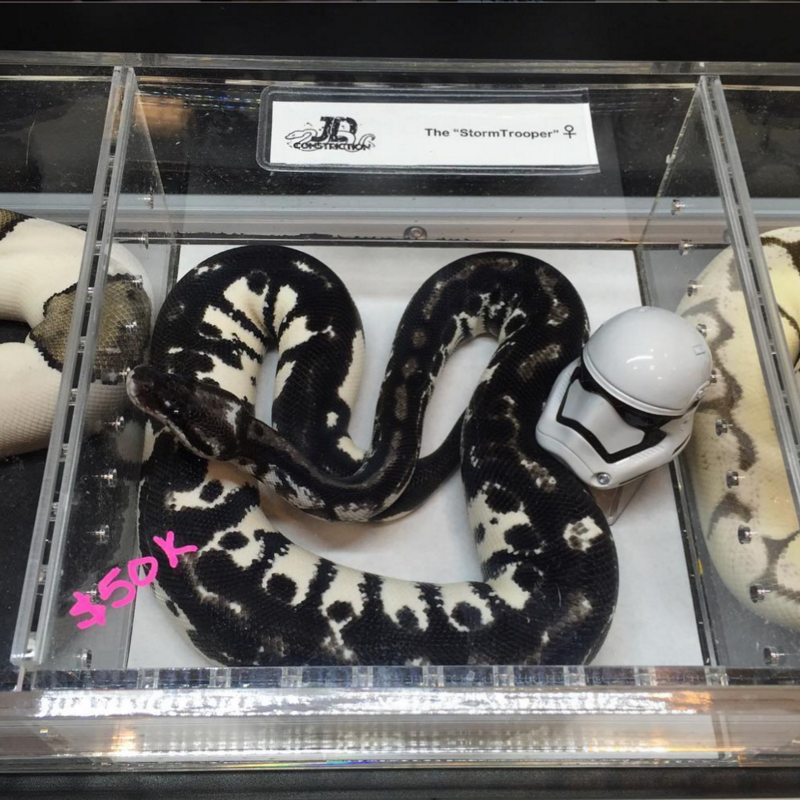 She (yep it’s a girl) hatched in the summer of 2015 and although there are several pictures both before and after the change to the “darkside” there is only 1 actual Stormtrooper anywhere. At the NARBC Spring Tinley that season we brought her along and had her priced for the first time while on our table (see picture). While we have had several 4 digit and 5 digit offers she has stayed here and has since been removed from being listed for sale entirely. For hobbyists that pricetag is quite expensive, but as expected for a one of a kind! I am hoping to produce more in the coming years but they will likely be similarly priced until there is enough of them to transition over into a hobbyist market and would be more affordable at that time. As for when that will be? Honestly it’s anybody’s best guess. With the pairing that produced her being a bit of a mystery (ie 2 males were introduced to the dam) and the odds having to stack up again in our favor genetically to hatch one, it will be a few seasons before we would likely hatch another. AND THEN likely a couple more seasons after that until we offer any for sale to first build a breeding group of our own of them. In other words a guess would be that there may be some for sale in 3-5 years from now but they would be at extremely high prices for most enthusiasts. The great news tho is that the Stormtrooper herself has quit changing color, is feeding and growing well, and is on track to join our breedings during the 2017/2018 season! With the addition of her breeding as well as her dam we will have a lot better odds of producing more and figuring out her genetic mystery. Or for pics of some of the animals listed above see our store at MorphMarket! Thank you and hope this helps!!! I did a video update on some of the awesome stuff we hatched out this past year and wanted to make sure and link it here! The “Stormtrooper” is going to the darkside! 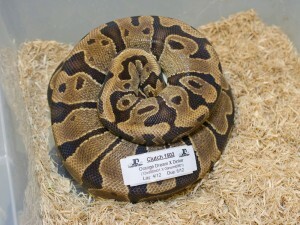 For the previous blog post about this CRAZY looking ball python see my post HERE! The “Stormtrooper” continues to impress! As crazy as it sounds this is the VERY same animal I posted previously and took a YOUTUBE VIDEO of! Things have DEFINITELY changed as this animal has grown! 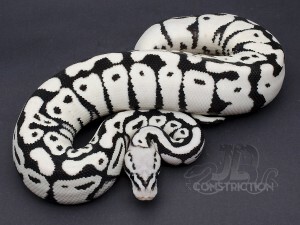 For awhile now I’ve had some weird things floating around in my collection which cause a few of my animals with Pastel and Axanthic to gain melanin (turn darker/black) in certain areas as they age where they normally are white/grey. I dubbed the first animal “Darkness”. Other instances where this weird color change has appeared is in combos, which I have playfully dubbed “dirty” in the name of the combo. 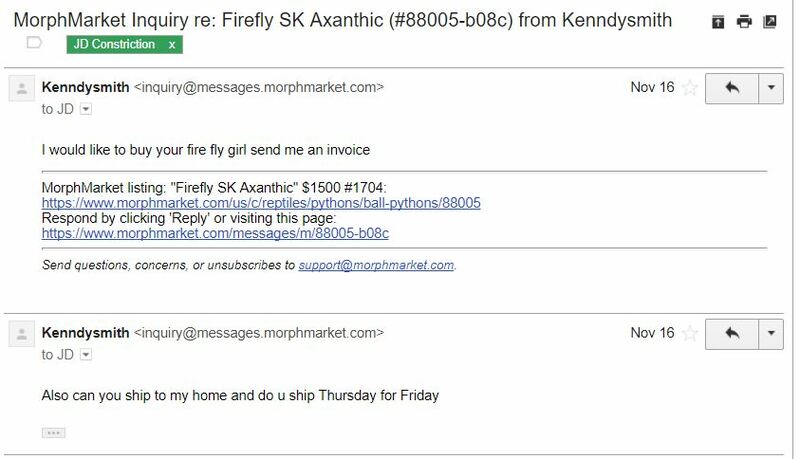 As seen here with a “Dirty” Firefly Axanthic. So what does the future hold for this combo? “Het” is short for Heterozygous. In the “Het Axanthic” case they are non-visually Axanthic animals which carry the recessive gene for Axanthic. 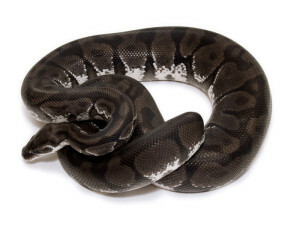 When bred to another het or visual Axanthic (of the same line) they produce visual axanthics but they themselves look no different from animals that are not het axanthic (ie a bee het axanthic and a bee look the same, a normal and a het Axanthic look the same, etc). Basically an animal that is “het” for a recessive doesn’t look any different than an animal without those words “het” after it. The power is in their underlying genetics. Or to put it in genetics speak, their Phenotype is normal and their Genotype is Heterozygous Axanthic. If they look the same how do I know it’s a het? The simple answer is to only buy hets from breeders with a solid history in the industry and who have produced visuals as well. 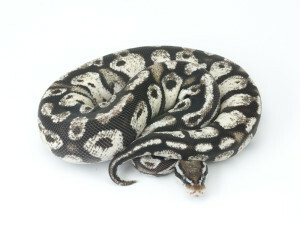 Hets are the bi-product of visual Axanthic breedings so it is VERY important to purchase them from a breeder who carefully tracks their breedings and can provide that background for a het animal they are selling. If someone doesn’t have any information about the pairing that produced the “het” animal be very weary about that animal proving out to actually be het. When an animal is “Axanthic” then it is a visual Axanthic (aka Homozygous). Axanthic is a simple recessive gene so there are visual carriers (homozygous) and non-visual carriers (heterozygous). Or once again in genetics speak, their Phenotype is Axanthic and their Genotype is Homozygous Axanthic. 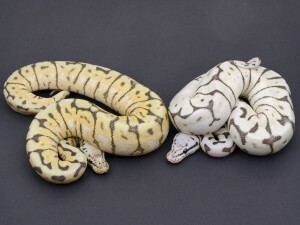 To put it visually here is a picture of a Killerbee het Axanthic and a Killerbee Axanthic. The yellow colored animal on the left is the heterozygous (het) Axanthic and looks just like a regular killerbee would. The grey and white colored animal on the right is the homozygous Axanthic (aka visual Axanthic or just ‘Axanthic’). I posted pics of this beauty as she started to change colors on my Facebook Page and the most recent pic I posted went somewhat viral! (atleast for my humble page) Resulting in over 300k views and 3k+ shares in only a few days. WOW! Since I have yet to figure out the genetics of this beauty a few folks have playfully called her a “Stormtrooper” which I think is super fitting as I’m a huge fan! So until the genes are figured out I think that’s a great pet name for her! If it’s not a fluke, a best guess is that the parents carry a recessive gene, something like Desert Ghost along with Pastel and Axanthic. I’m performing breedings this year (2016 Season) to see if I can figure it out. Since I’m asked very often, everything has a price so I would reluctantly consider selling her, offers less than 5 digits sadly would NOT be considered. The video tells the tale but here is also the pic that got several folks talking! Thanks for watching, enjoy, and I’ll def keep posting updates! Things have really been awesome these past several weeks as far as hatching. I have REALLY had a great season so far and with every new clutch hatching it seems I’m totally lucking out and hitting on some of the exact things I’m looking for! On top of being EXTREMELY lucky! This little girl just crawled out today in fact! 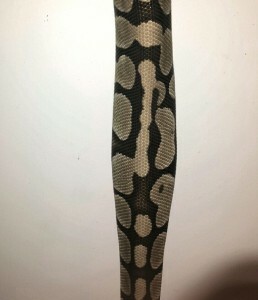 I’m super excited to have my Leopard het SK Axanthic male do a little fathering of some clutches. This would be the 3rd visual Axanthic combo animal with Leopard I’ve hatched so far this year with atleast 1 more clutch with possible Leopard Axanthic stuff in it! The other fun animal that hatched out and was a HUGE surprise this season was also VERY rare! 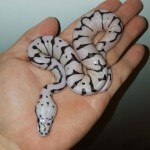 I purchased some Vanilla het SK Axanthics a few years back which were also possible het for ghost. 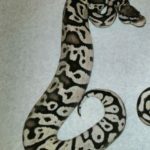 Further from a great friend I got a female double het SK Axanthic Ghost I ran that Vanilla het Axanthic possible het Ghost to and VOILA! 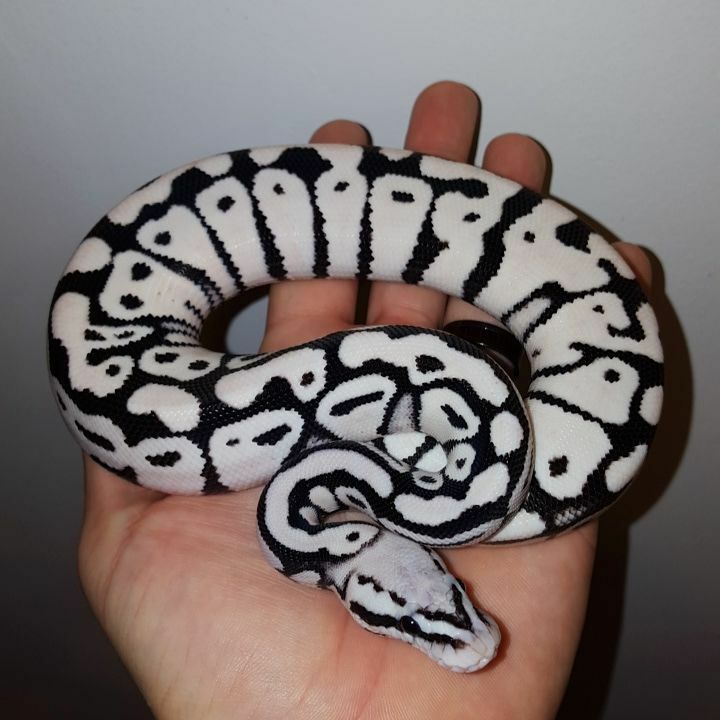 I ended up not only proving my Vanilla het for both but ALSO luckily producing this awesome True Ghost! Very excited to see her color up! Lastly, but certainly not least, I had bred my Firefly Axanthic to a couple of big Yellowbelly het Axanthic girls in high hopes of hitting on this combo! A Firefly Yellowbelly Axanthic! Not “very” much different that the Firefly Axanthic to most but definitely more aberrant pattern and just overall a wickedly patterned and colored animal! I have high hopes for this male in the next few seasons as I think those genes mixed in with other pattern morphs will truly be outstanding! 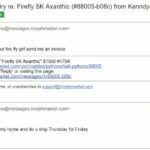 Imagine Firebee Yellowbelly Axanthics!!! So far indeed has been an awesome season and I really look forward to what other animals pop out in the coming weeks! We are over 1/2 way but I still expect some really neat new combos for us to be hatching! Further show season is just around the corner and I can’t WAIT to start seeing folks and talking more about Axanthics in person! Hope to see you out there! I’m super pumped to start seeing some of the wicked Axanthic combos I had hoped for this season start showing up! We are just getting into our hatching season and already I hit on not 1 but 2 Firebee Axanthics! 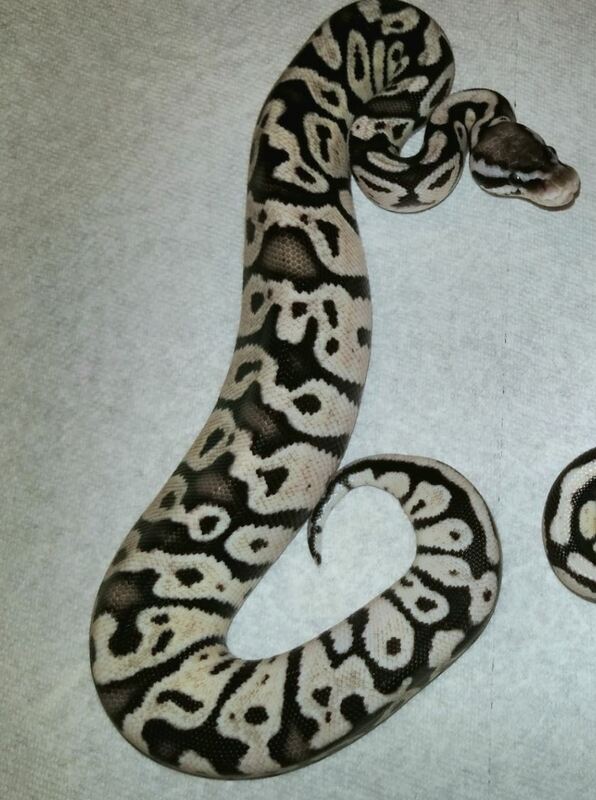 From breeding a Firefly Axanthic to a Spider het Axanthic no less which is a 1 in 16 chance! I am excited to see how they will color up! The goal being of course to have as black and white a spider as an adult as possible while retaining as much contrast as possible. 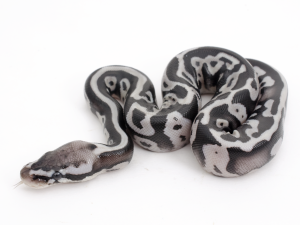 Bee Axanthics tend to turn a light “grey” as they age and while the Killerbee Axanthics have a great dominant coloration as adults the “super pastel” causes alot of fading of the blacks making for less contrast. 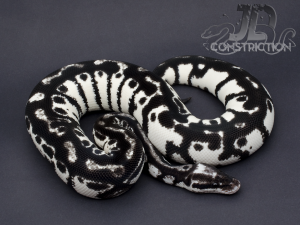 Contrast is where it’s at with Axanthics so the Firebee should be the first step towards making that white and black combination as an adult! On top of the Firebee Axanthics we have been super lucky to also hatch some very nice Axanthic combos in the process. Not just awesome to do comparison photos but honestly great looking examples! Overall a VERY excited season with a new record number of clutches for us and some great pairings! Keep an eye out for more fun stuff as we start seeing more things out of the eggs! 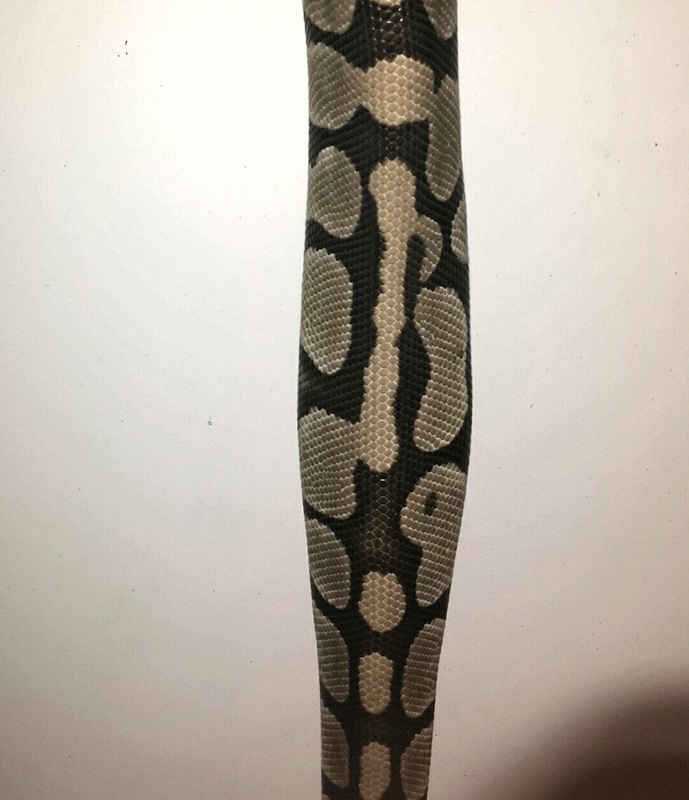 It’s that time of year again when you’ve been pairing snakes for what seems like years (but has maybe only been months) and you are wondering what the heck is going on! 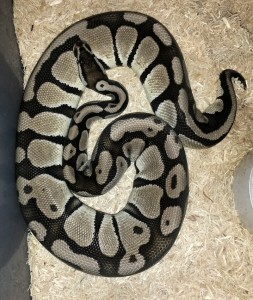 As I’ve gotten more and more breeder females over the years and have seen more and more female behavior it has gotten to be a much easier task to know what’s going on with my girls. One other variable that has helped me solidify my suspicions and helped me understand better what’s going on has been an ultrasound. Knowing what is going on isn’t always “needed” to be successful at producing babies, in fact it sometimes hurts your chances if you are overly curious and an over palpater! But all in all it’s definitely nice to atleast know who is going to produce eggs for you and what the signs are a lady is going to lay. One of the more helpful graphics of the female ball python cycle I admittedly stole off the interwebs, but only because it really is a great resource. 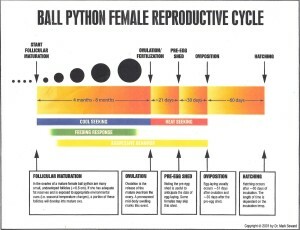 This picture of the Ball Python Female Reproductive Cycle is great for a number of reasons! One big take away is that it shows you that the “breeding” season for a female can last anywhere from 4 months to 8 months before ovulation! That’s a LONG time! However it lacks some of the details leading up to the big “OV” that might be more helpful. Even after having an ultrasound, trying palpating, and every other trick in the book I came back to a short list of what to look for in a developing female. I put together this graphic of the timeline I look for in a female to know whether or not she’s going to lay. And to be honest, unless I’m really unsure of what a female is doing and she isn’t moving along like I had been thinking I don’t use an ultrasound or palpate anymore at all. The list of what to look for can kind of be summed up into just a few key things. For me that last one is the most important indicator that a female is going to go for me. The first 3 give me an inkling that things are headed in the right direction. The female has been breeding well, was feeding aggressively at one point but has since shut off, is glowing and looks fantastic, and lastly is typically using the cooler end of the cage. A build isn’t the easiest thing to spot when a female is just laying there. It’s actually best if you simply get the female out of the cage and drape her vertically to see if there is any signs of a “ponch” in the lower 1/3 of her body. Again this is a female who has transitioned off of food so it’s not a rat she ate the other day, this is an “out of nowhere” slight bulge. For instance this female looks fairly “normal” and doesn’t appear to be building/ovulating or anything interesting going on at first glance. Notice tho she looks pretty darn good (glowing), is on the cool side (water dish off to the right) and she has been off feed. Also she of course has been breeding well and paired a few times with a couple of different males. All the signs that she might be heading towards producing some eggs for me this season! Now a look at the same exact female moments later draped vertically (hanging from my hand). A few gentle strokes to get her body relaxed and dangling shows a slight “bulge” forming in the lower portion of her body. The start of a build! Generically from here, depending on her last pairing, I would pair her one more time to make sure and then label her done on her breeding record. From there watching as the build continues to grow and keeping an eye out for an ovulation. Best of luck this season and every one after! 2015 is off and running! It’s official! 🙂 My first clutch of eggs laid in 2015! Granted it’s not an Axanthic clutch 😉 But it’s still exciting to see the results of a long winter of breeding. Also I’m VERY optimistic about this season compared to last season. This girl laid 6 plump white eggs which is a huge improvement over last year’s slug-o-ramma! So needless to say I’m looking forward to what hatches this summer! If you are looking to see what all may be hatching and get on my waiting list feel free to head over to my Waiting List page! Get an email notification when our availability changes!